Yuccas are unique evergreen plants that add flair to the landscape like few other species. They look like something from the age of dinosaurs with their enormous leaves and flowers, but they are surprisingly easy to grow in most parts of the country. Most yuccas are native to the southwestern United States and Mexico, though some species can be found in the wetter, more humid eastern states. They have evergreen sword-shaped leaves up to two feet long and flower stalks that rise three to 10 feet above the foliage in late summer or fall. 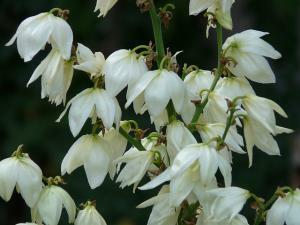 The single flower stalk is decorated with a mass of white, bell-shaped flowers that are often fragrant. Most species grow as a single clump of leaves at ground level, but some have a short trunk with a mass of foliage at the top that looks like a small palm tree. The foliage is thick and leathery and has traditionally been used as a source of cordage, as well as a primitive form of shampoo. 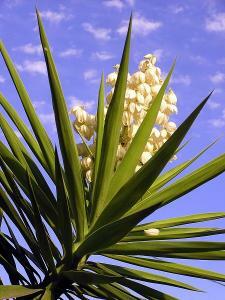 Yucca requires excellent drainage and grows best in dry, sandy or rocky soil that is low in fertility. It's a good choice for landscaping in these tough garden conditions where most plants would fail to thrive. If these conditions are not available, they can be created by planting yucca in a large container or on a raised mound with sand mixed into the soil. 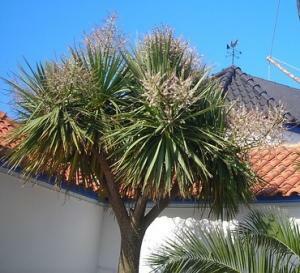 Full sun is a prerequisite for growing yucca and they appreciate the hottest spot in the garden, such as up against a south-facing wall or in areas surrounded by pavement. The leaves of most species have a sharp tip, so it's important to plant yucca away from pathways or anywhere else that someone would be likely to brush up against them. 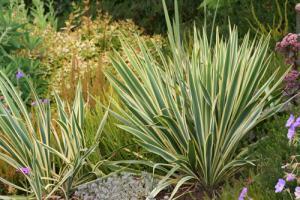 Yucca needs a bit of water to get established in the first year after planting. Otherwise, they are very low maintenance - avoid fertilizer, irrigation and mulch as these will only harm the plants. The flower stalks should be removed after the blossoms fade and the dead leaves that tend to form at the base of the plants can be removed periodically. Pests and disease are rarely encountered with yucca though excessively wet conditions inevitably lead to the slow demise of the plants. 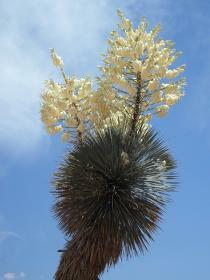 The roots of yucca have medicinal properties and have traditionally been used to treat inflammation and for pain relief. Keep in mind that in the case of a plant like yucca, which has a single taproot, it's not possible to harvest the root without killing the plant. But if you do harvest the roots, it's always better to do so early or late in the growing season, rather when the plant is producing flowers and seeds. Yuccas are popular landscaping plants in arid regions, but they are not always available at local nurseries in other locales. 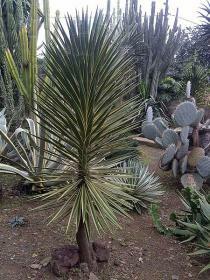 For a good selection of yuccas online, Plant Delights Nursery, Inc. and Yucca Do Nursery, Inc. are good options. There are dozens of species and cultivars available, but this is a sampling of the most popular varieties for landscaping use. Also known as Adam's Needle, this species forms a clump of leaves about 30 inches tall and wide with flower stalks that rise six feet into the air. It's suitable for USDA zones 4 to 9. 'Bright Edge' has golden margins along the leaves. 'Color Guard' has a cream-colored stripe down the center of each leaf. Also known as Spanish Bayonet, this species has several trunks that branch out from a single base, eventually reaching about 10 feet in height; it's hardy in USDA zones 6 to 10. 'Variegata' has whitish-yellow stripes along the margins of each leaf. 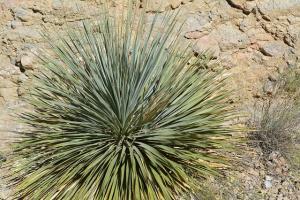 Also known as curve-leaf yucca, this species has a single trunk six to 10 feet tall and does not have the dangerous spines at the ends of the leaves like most yuccas. It fares well in USDA zones 7 to 10. 'Margaritaville' has leaves with a graceful weeping habit. Also known as Beaked Yucca, this species has blue-green leaves and grows with a single trunk up to 10 feet tall; it's hardy in USDA zones 7 to 10. 'Sapphire Skies' has true blue leaves that droop sightly and lack pointy tips. Yucca is a plant that doesn't go unnoticed. They are not for every landscaping situation, but if planted in the right location, their unusual form is a priceless asset in the garden.